Martin Luther King, Jr.’s struggles and triumphs were not omitted from our collective national history, yet the details of his legacy are recalled only in part. The annual Dr. Martin Luther King Jr. IAP Design Seminar chose this year to bring MIT’s focus on the civil rights leader to one of the dreams America has forgotten. After the battle King and other leaders waged against the segregation of blacks and whites ended, King’s heart and mind turned to the economic plight of black Americans. King’s forgotten dream was one of economic equality. King perceived his non-violent battle against injustice as dependent upon righting economic inequalities. King saw poverty as a debilitating force that held black Americans from fighting for their own basic rights. However, in his fight against poverty he called on all Americans regardless of their race or ethnicity. King fell to the bullet of an assassin in 1968 while planning the Poor People’s Campaign. This campaign sought to provide income or jobs to the nation’s poorest citizens. After King’s death, his closest aides and advisors built Resurrection City, a camp for the poor, on the mall in Washington, D.C. Resurrection city, ultimately disbanded by governmental order, did not achieve the elusive goal of ameliorating the position of the nation’s poor. Today, MIT’s Design Seminar in honor of King, continues the fight for the impoverished in America. In agreement with the goals King marched for 40 years ago, students participating in the seminar created an installation concerned with the issue of poverty in today’s society and the numerous affects it continues to have on society in Lobby 10. Though poverty in the U.S. was not the single issue that concerned the diverse group of students in the seminar, it stood alone as a significant part of King’s dream which tragic circumstances prevented him from accomplishing. This imbalanced scenario sounds all too familiar. President George Bush recently announced a $12 billion plan to send astronauts back to the moon as the U.S. deficit balloons and the war on terrorism rages on with an $87.5 billion backing. So while the government hopes to ensure the nation’s well being from the evils of terrorism it undermines the fragile existence of the poor. Our tax cuts undercut the middle-class and the poor as revenues fall but the already fat pockets of the country’s richest inhabitants continue to swell. When denouncing the Vietnam War, King declared that “the problem of racism, the problem of exploitation, and the problem of war are all tied together.” Though the particulars have changed, the end result has not. So we must proclaim as King urged many years before that we are “dissatisfied” with the status quo. 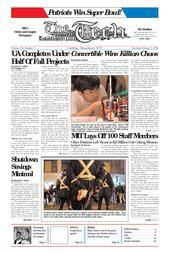 MIT administrators, faculty, students, and staff must be dissatisfied with the fact that the United States Census Bureau believes that $41,000, the yearly cost of MIT, is enough to keep two five-person families with three children under 18 above the poverty line. All of America must become dissatisfied that in 2002, 26.5 percent of single-parent homes headed by women are below the poverty line. The 2004 Martin Luther King Jr. IAP Design Seminar students invite all of MIT to join us in direct and active disapproval. Going into schools to talk about King’s legacy, working on an installation displaying the fight for economic justice, and writing about current inequities that exist in our society have all been the fruits of our dissatisfaction. Of what will your own consist? All of you have inherited the rich wisdom of King’s many dreams. How will you use it? King dreamt of lands unscorched by missiles seeking political aims through violent means, he dreamt of a guaranteed annual income for America’s burdened and exploited citizens, he dreamt of political leaders wielding power motivated by love. So, although poverty is a worthy struggle, there are many more. Dissatisfied individuals must only choose one. Perhaps next year we might make honoring Dr. King a true celebration having fought for the restructuring for which he gave his life. Currently Americans are complicit in their silence with governmental policies that neglect the poor and harm those abroad. However, because of the civil rights movement, the women’s movement, and the Mexican-American labor movement America has a more able and diverse reserve of human capability. Arguably, our aptitude to overturn corruption and injustice is greater. If the problem has grown, America’s citizens of all races and ethnicities must add their cognitive abilities to create political and social strategies that work. If we are to get over the mountain of adversity that stands between our country’s present reality and the promised land that envisioned by King, we must surmount the obstacles of racism, sexism, poverty, AIDS, bride burning in India, genocide, corrupt regimes, heterosexism, and all other social pathologies that plague our world together. Charlotte L. Newman is a senior at Wellesley College and a member of the Martin Luther King Jr. IAP Design seminar.